Bladder stones are urinary mineral deposits that gather in the urinary tract and crystalize over time. The crystals then build upon each other to create "stones". They cause urinary tract irritation and pain during urination. Eighty-five percent of the stones are formed in a dog's bladder, but they can also be found in the entire urinary tract - in the kidneys (though rather rare), the ureters (tiny tubes that carry urine from the kidneys to the bladder), or urethra (the tube from the bladder to the outside of the animal). When a stone that has passed into the urethra is large enough, it can cause blockage of the urethra. When this happens, the dog cannot urinate. 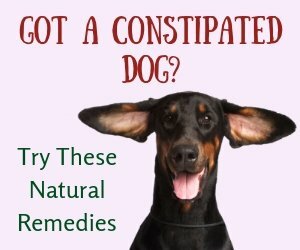 This obviously could be a life threatening condition, as toxins and waste cannot be eliminated in the urine from the dog's body. This requires emergency operation to remove the stones from the urethra. 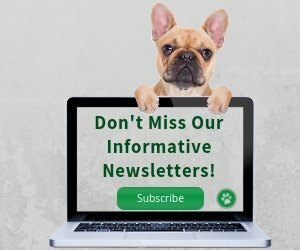 What Causes Bladder Stones to Form in Dogs? 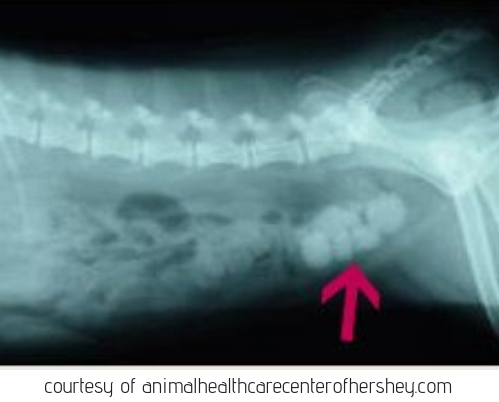 How Do You Know if Your Dog Has Bladder Stones? How Do You Get Rid of Bladder Stones in Dogs? These stones are composed of magnesium, ammonium, and phosphate and form in urine that has a neutral or alkaline pH level. They are the most common type of bladder stones in dogs and occur more frequently in female dogs. 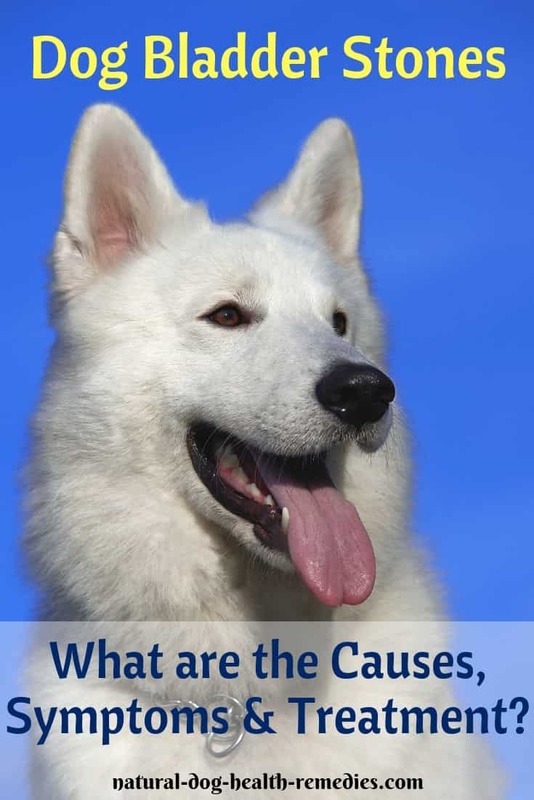 These stones are found in certain breeds of dogs as a result of a hereditary condition. Specifically, these dogs lack nephrocalcin, a calcium-binding glycoprotein, which inhibits the development of calcium oxalate crystals in the urinary tract. Also, dogs with Cushing's disease are predisposed to calcium oxalate bladder stone formation, due to elevated calcium levels in their urine. These stones are formed almost exclusively in Dalmatians (about 80% of dogs with uric acid stones are Dalmatians) because of the inability of their livers to absorb uric acid. Two other breeds that can be genetically predisposed to uric acid bladder stones are Bulldogs and Russian Terriers. Uric acid bladder stone formation can also be caused by a liver shunt. Have your vet check your dog for the presence of urate crystals (which lead to uric acid stone formation) on a regular basis if your dog has a liver shunt. Diet: Some foods can cause bladder stones in dogs. Specifically, diets that are too high in protein and certain minerals, such as calcium and magnesium, may increase the chances of the formation dog bladder stones. Hard Water: Hard water contains minerals such as calcium and magnesium. A 2016 report by an American Pet Insurance Company (Trupanion) indicated that pets in areas of the USA with very hard water had higher risks of urinary issues such as bladder stones. Age: Older dogs are more prone to develop bladder stones. Genetics: For reasons unknown, some breeds are more susceptible to bladder stone formation than others. Small dogs, such as the Pug, Pekingese, Yorkshire terrier, Beagle, Dachshund, Welsh Corgi, Miniature Schnauzer, Bulldog, and Cocker Spaniel, are among those unlucky ones. And, as mentioned above, Dalmatians tend to have uric acid bladder stones. Lack of Exercise: Dogs that are couch potatoes and do not get to go out to eliminate wastes several times a day are also prone to develop bladder stones. As mentioned above, if there is a a complete blockage of the urethra, the dog cannot urinate at all. 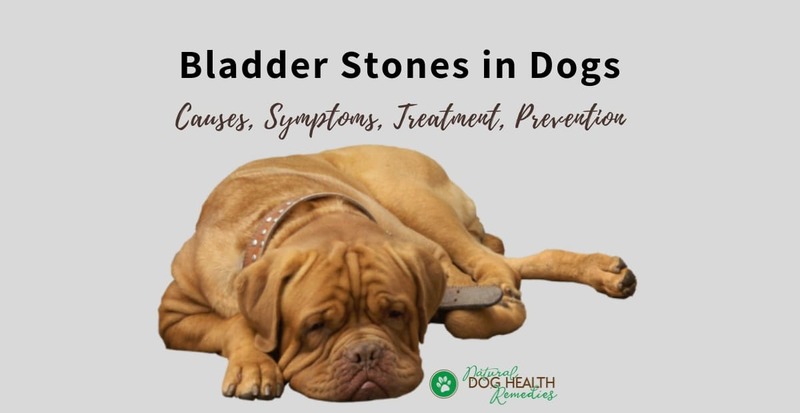 If you see any of these signs in your dog, take him to the vet immediately for a checkup because, as you can imagine, bladder stones can cause a lot of discomfort and pain to the dog. How to get rid of bladder stones in dogs depends on the type of stones, the size, the number and location of stones. For example, if the stones are in the urethra or the ureters, surgery is necessary since urinary obstructions are life threatening as they can lead to kidney shut down and death. If the stones are in the bladder and they are struvite stones, there are other choices. For example, you can get rid of the stones by feeding your dog a special diet (low in calcium, magnesium and protein) together with dissolving agents in it. 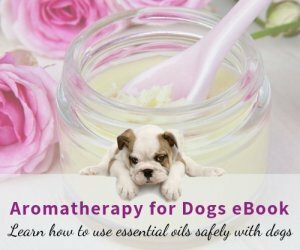 These agents will eliminate the stones by dissolving them and causing them to pass through your dog's system. For dogs with uric acid stones, a diet that is low in purines may be recommended. Purines are found primarily in animal proteins and are metabolized into uric acid in the body. Purine-rich foods include organ meats (e.g. liver, kidneys), seafood, and legumes. If your dog has bladder stones, it is essential to have a proper diagnosis to determine, among other things, the type and the location of the stones. If the stones are not creating any blockage and are of the type that can be dissolved, you may want to try using natural remedies such as herbs and dietary supplements to eliminate the stones.